DENKIs are Dual ENKephalinase Inhibitors designed and developed by Pharmaleads to inhibit the two enzymes APN and NEP responsible for the degradation of enkephalins therefore locally increasing the concentration of enkephalins – which are released by the painful stimuli – and, as a result, allowing the natural ‘physiological’ management of pain to occur. Pharmaleads’ products are the only drug candidates in clinical development that target the two enzymes responsible for the degradation of enkephalins. 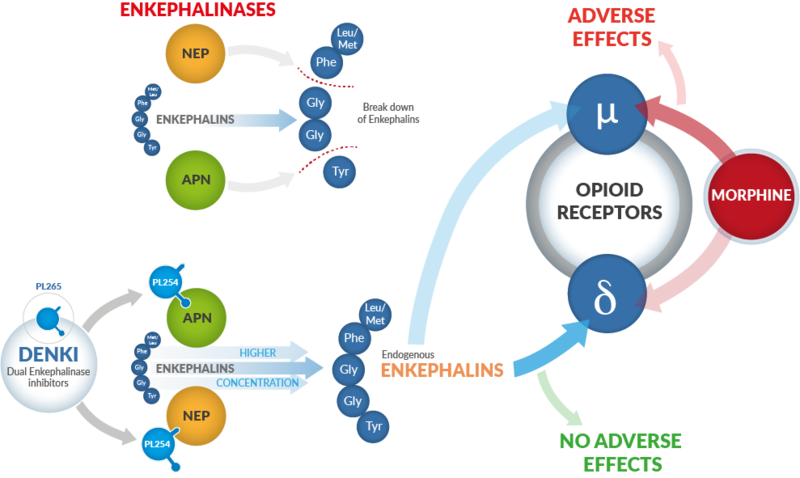 In contrast to opiates which act on opioid receptors body-wide, including areas not involved in pain control, enkephalins are only secreted in areas where the body has detected a pain signal.